Paris - The Champions League returns this week with the competition now into the quarter-final stage and dominated by the Premier League with all four English representatives in the last eight. Tottenham Hotspur and Manchester City go head-to-head, but Barcelona's clash with Manchester United is the tie of the round. Spurs galvanised in new home? Rarely in the recent history of the competition has it felt quite so important for the hosts in the first leg to make home advantage count as much as it does for Tottenham ahead of City's visit to north London. Tuesday's clash will be just their second game in their brand new 62,062-seat stadium, with this the first of three meetings between the clubs in 12 days -- Spurs will need a cushion to take to the Etihad Stadium for the return leg, before taking on City again in Manchester in the Premier League on April 20. "This is a stadium that is going to help us achieve all that we want," says Spurs boss Mauricio Pochettino, but he knows the size of the task facing his team against a City side that scored 72 goals since Boxing Day. There have not been many all-English ties in this competition in recent years, although City did lose to Liverpool at this stage a year ago. Will draining season catch up on Liverpool? Can Liverpool keep up the fight for Champions League glory in the midst of a draining Premier League title battle with City? That is the biggest doubt surrounding Jurgen Klopp's team, otherwise heavy favourites going into their tie against Porto. That said, they remain on course to repeat last season's run to the final after beating Bayern Munich in the last round. And the quarter-final draw was kind, pairing Liverpool with a team they hammered 5-0 on aggregate in the last 16 last season. The loss of Andy Robertson to suspension in the first leg is a blow, although Porto -- three points ahead of with Benfica, who play on Sunday evening, at the top of the Portuguese league -- are without the banned Pepe and Hector Herrera. A step too far for Solskjaer? In terms of history, this is the tie of the round, a meeting of two clubs with eight European Cups between them, and a repeat of the finals of 2009 and 2011. Both of those were won by Barcelona, and the Catalans are heavy favourites against a United side sixth in the Premier League and in their first Champions League quarter-final since 2014. At least the Old Trafford club had a weekend off to help prepare, allowing manager Ole Gunnar Solskjaer to travel to take in Barcelona's 2-0 win over Atletico Madrid on Saturday which put them 11 points clear at the top of La Liga. These are slightly strange times for Solskjaer, the match-winner when United beat Bayern Munich in the 1999 final at the Camp Nou. He may have just been anointed as permanent United manager, but his team have lost three of their last four games. Were the Old Trafford board a little hasty in making the appointment? One thing though: Barcelona have not won in six away matches in the knockout rounds, scoring just once in that time. 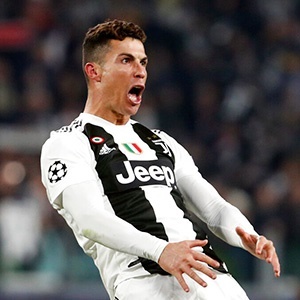 Cristiano Ronaldo has not played for Juventus since suffering a thigh injury on international duty with Portugal last month, raising concerns that he could miss the first leg of Juve's tie against Ajax in Amsterdam. However, Juventus coach Massimiliano Allegri has insisted there are "good signals" from the 34-year-old forward, whose hat-trick did for Atletico Madrid in the last round. With or without him, this will be a fascinating clash between the experience of Juventus -- who have another Serie A title practically in the bag -- and an Ajax side carried by the club's latest batch of young talent. With the likes of Matthijs de Ligt and Barcelona-bound Frenkie de Jong, alongside older heads such as Dusan Tadic and Daley Blind, Ajax dumped out the holders Real Madrid in the last round, setting up a repeat of the 1996 final, which Juve won on penalties.